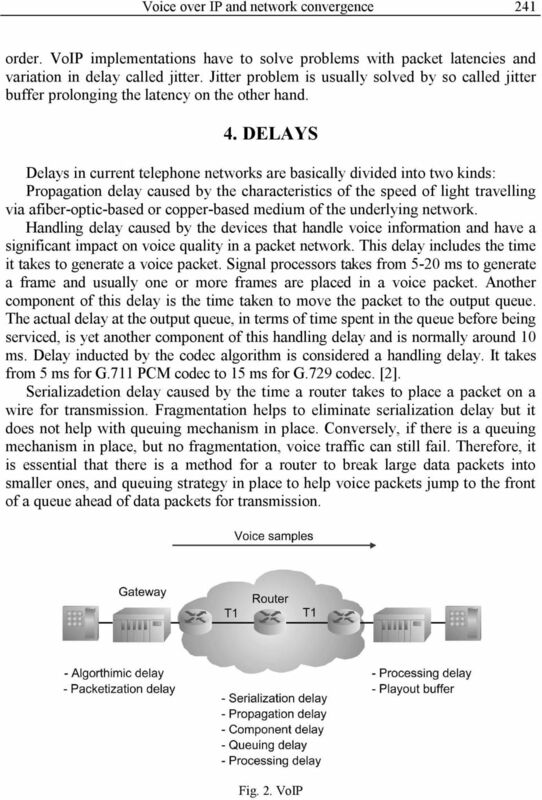 Download "VOICE OVER IP AND NETWORK CONVERGENCE"
1 POZNAN UNIVE RSITY OF TE CHNOLOGY ACADE MIC JOURNALS No 80 Electrical Engineering 2014 Assaid O. SHAROUN* VOICE OVER IP AND NETWORK CONVERGENCE As the IP network was primarily designed to carry data, it does not provide real-time guarantees but only provides best effort service, which is inadequate for voice communication. Upper layer protocols were designed to provide such guarantees. Further, as there are several vendors in the market implementing these protocols, conformance to standards and interoperability issues have become important with general VoIP (Voice over Internet Protocol) description noting VoIP advantages, disadvantages, problems with reliability and security. 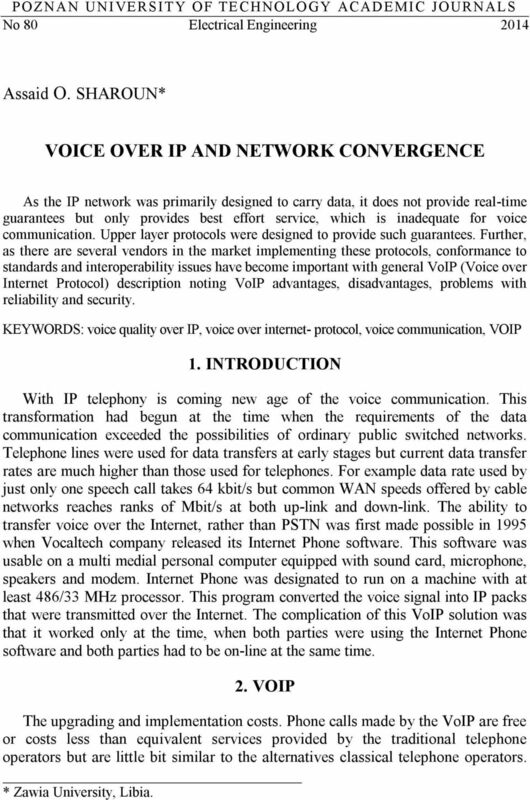 KEYWORDS: voice quality over IP, voice over internet- protocol, voice communication, VOIP 1. INTRODUCTION With IP telephony is coming new age of the voice communication. This transformation had begun at the time when the requirements of the data communication exceeded the possibilities of ordinary public switched networks. Telephone lines were used for data transfers at early stages but current data transfer rates are much higher than those used for telephones. For example data rate used by just only one speech call takes 64 kbit/s but common WAN speeds offered by cable networks reaches ranks of Mbit/s at both up-link and down-link. The ability to transfer voice over the Internet, rather than PSTN was first made possible in 1995 when Vocaltech company released its Internet Phone software. This software was usable on a multi medial personal computer equipped with sound card, microphone, speakers and modem. Internet Phone was designated to run on a machine with at least 486/33 MHz processor. This program converted the voice signal into IP packs that were transmitted over the Internet. The complication of this VoIP solution was that it worked only at the time, when both parties were using the Internet Phone software and both parties had to be on-line at the same time. 2. VOIP The upgrading and implementation costs. Phone calls made by the VoIP are free or costs less than equivalent services provided by the traditional telephone operators but are little bit similar to the alternatives classical telephone operators. * Zawia University, Libia. 5 Voice over IP and network convergence CONCLUSION As the Internet has revolutionized the nature of business and social live, the Internet penetration grows exponentially. As the available internet bandwidth grows it is clear, that VoIP technology is pushing out standard circuit switched technology and in the near future will be switched networks completely obsolete. However, VoIP still suffers from packet transmission related problems like jitter, network congestion and so on. 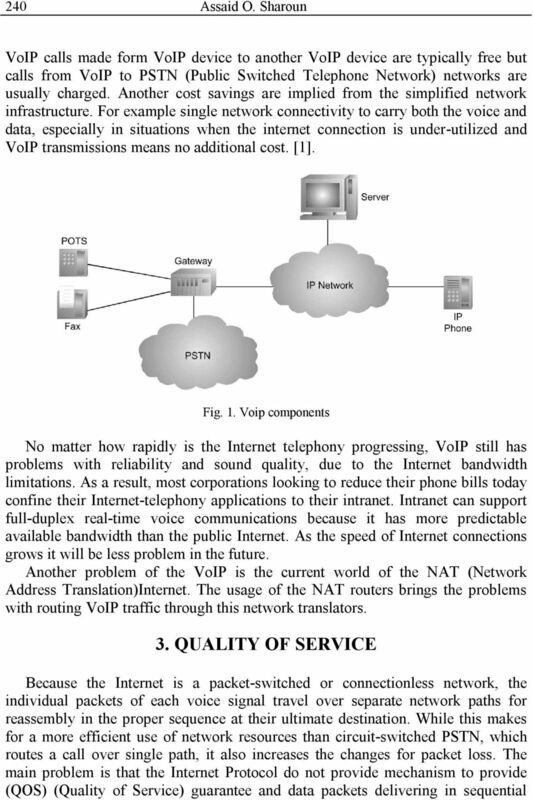 My project was concerning with general analysis of VoIP technology and has mentioned some related network problems and their solutions. In practical part I have configured Linux private branch exchange based on the Asterisk project. The configuration, I have done, was quite simple but I have to mention, that it was completely new topic for me and therefore it took me a lot of time to understand it. It consisted of one PSTN ISDN line, one old ISDN private branch exchange and one VoIP phone interconnected one another with an Asterisk software to be an integrated private branch exchange. PSTN ISDN line was connected over ISDN interface card Fritz!Card DSL running in TE mode and old Fritz!X PBX was interfaced with a HFC-S based interface card running in NT mode. I have also configured traffic controlling script for prioritization VoIP traffic over normal non real-time traffic.asterisk exchange is very complex and complicated systems and so are complicated all the protocols. I still can not fully understand how it is possible that so profitable system could be free of charge. 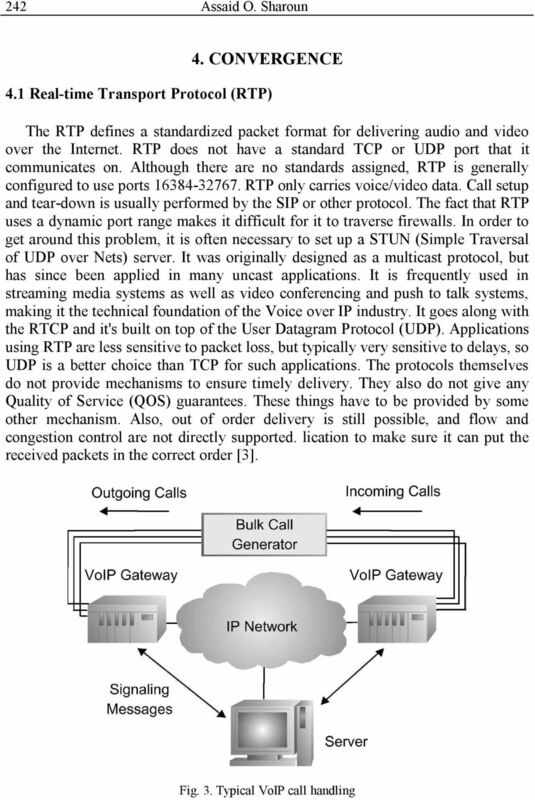 REFERENCES  Voice over IP. URL: < [cited ]. MADSEN, L. et al. Asterisk: The Future of Telephony. 1st edition. Sebastopol: O'Reilly, pages. ISBN:  Skype. 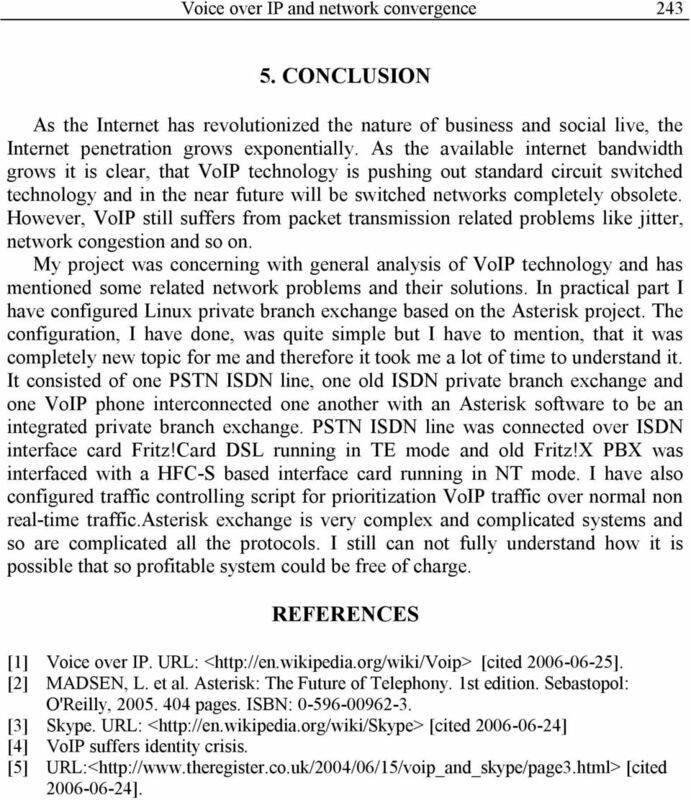 URL: < [cited ]  VoIP suffers identity crisis. URL:< [cited ]. Optimizing Converged Cisco Networks (ONT) Module 3: Introduction to IP QoS Introducing QoS Objectives Explain why converged networks require QoS. Identify the major quality issues with converged networks. This topic lists the key mechanisms use to implement QoS in an IP network.